If you are a Facilities or Maintenance Manager, finding a reliable, local Gas Engineer to service your commercial appliances can be difficult. At Clifton's, we aim to make that task easier. We provide expert professional Gas Engineers and similar to our domestic services, all of our Commercial Services go through the same four steps. 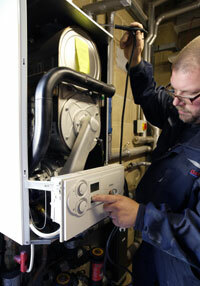 Examination - One of our Gas Safe Registered Engineers will examine every part of your Commercial Appliance, including the Flue and any additional controls to ensure that they are all in full working order. Strip Down - Our Engineer will then Strip Down your appliance and give it a thorough clean from top to bottom. Ensuring that each part is made as efficient as possible. Pipework - Once the appliance has been fully examined, deemed safe and fully cleaned, our engineers will then check all of the pipework, ensuring that there are no cracks to prevent the chances of a Gas Leak. Certificate - As soon as our engineer has completed the service of the appliance and it has been deemed safe to use, we will issue a certificate to verify its safety. Cliftons cover an extensive range of Commercial Repair Services for a variety of commercial clients, ranging from retail to warehouses. Our growing portfolio includes Listed Buildings, Schools, Offices, Hotels and more. All of our Commercial Plumbers and Gas Engineers are fully CRB checked to an intensive level to give you that extra piece of mind.